Digital Foundry on the Wii Mini: No internet access, no 480p, not even that small. It was fair to expect that the Canada-only Wii Mini wouldn't come with all the bells and whistles of its glossy white predecessor. At $99, you expect some sacrifices to be made; But perhaps not quite this many. According to an in-depth breakdown over at Eurogamer, not only does the Wii Mini ship without wi-fi, it doesn't support the Wii USB Ethernet adapter either. In fact, it seems Nintendo has removed the internet connection sections of the console's menu completely. While the lack of access to Nintendo's notoriously fiddly online service might not be a deal breaker, the console's limited output just might be. Unlike the original Wii, the Wii Mini doesn't support component cables. The console only supports composite, the same red, white and yellow cables you may remember from the days of the PS1. With component cables, the original Wii is capable of 480p output, which, while still sub-HD, is far sharper than the 480i provided by composite. In short; Playing on a HDTV is going to be like onion appreciation day on Planet Teargas. 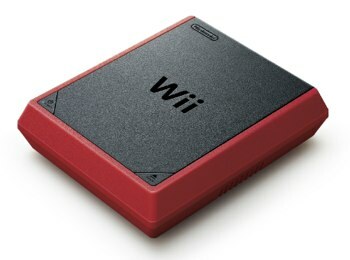 So, lacking 480p output, online capabilities and Gamecube support, the Wii Mini barely lives up to the "Wii" half of its name, but what about the "mini" part? The startling reality is that the new model isn't actually that much smaller than the original model to the point where calling it the "Wii Mini" comes across as something of an exaggeration. It's a little shorter and lighter than our launch unit but it's just as chunky. While I'm not exactly a fan of Nintendo's seemingly inevitable handheld hardware revisions, the company has always managed to strike the right balance between omitting features and improving design. The Wii Mini, with its stripped-down hardware and 1980s lunchbox aesthetics, might just be the first time Ninty's missed the mark.